This fast curing, durable optical coating features excellent adhesion, low viscosity, great coating stability and a special bonding chemical formulation and unique UV/thermal hybrid chemistry. UVMAX-QT lens coating is optimized with HCLT (Hybrid Cross Linking Technology) during lab production, which ensures the best lens coating adhesion, abrasion and yields and tintability. Better filtration results in less impurities, which improves coating performance; and because it contains no volatile solvents it is safe for standard shipping and handling. No problem switching coatings; formulated for plug and play use and is compatible with all standard UV curing systems and bulbs, as well as with all standard spin lens coaters. UVMAX QT lens coating has excellent adhesion to AR, and a high Bayer abrasion ratio. It provides superb adhesion to all substrates including standard plastic, Polycarbonate, Trivex, Spectralite, 1.56 and 1.58, and Hi-Index. The Quick Tinting (QT) coating produces Grey 3 in 15 minutes. 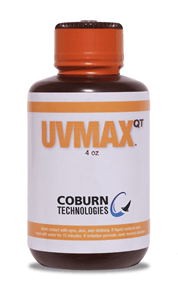 UVMAX QT is exclusively manufactured and distributed through Coburn Technologies.